Casper Skulls released an album this month. It's called Mercy Works. I bought a copy of this album at the show at Spirit with One Hundred Year Ocean. I really liked Casper Skulls live set, but what do they sound like on the record? Well first, let's take a look at the cover art. 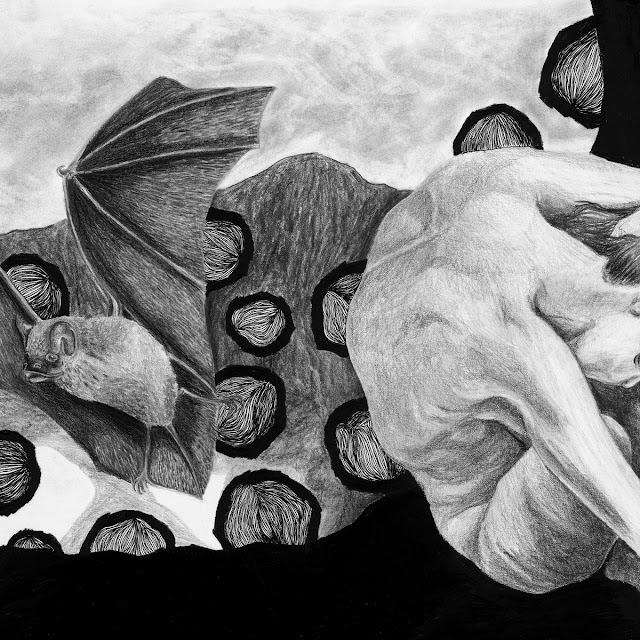 It's a dream-like drawing of a human and a bat, and it wraps around to the back. It's eerie, reminding me of early 3D computer games like Immercenary on 3DO. There's something incomplete, murky, and cruel about the crudeness. I can't say the same about the musick within, unfortunately. Mercy Works (LP) by Casper Skulls The first track is a portal into another world titled after the album. The second track comes in somewhat jarringly, the production goes from murky strangeness to extremely clean and poppy reverb-land. "You Can Call Me Allocator" is a good song. The guitar and drums sound awesome. The vocals sound like Lee Ranaldo. "Lingua Franca" is basically a pop song. It almost sounds like Taylor Swift or something like that. It is good, and I really like the chorus. I wish it was a little less of the usual though, a little less clean. Again, I really like the guitars, especially the Neil Young meets Sonic Youth solo, and the vocals. The fourth track, "What's That Good For", really sounds like a Pavement song, vocals and all. It's decent, though it's weird that it sounds so close. The backing vocals are okay, but it almost seems like padding to a somewhat weak chorus. The fifth track, "Primeval", reminds me again of a Lee Ranaldo-written Sonic Youth song. I'm not sure what to make of it. I like the sadness, the melancholy of defeated resignation. The lyrics sound like what's been going on in Pittsburgh and many other places. Condos will one day surround my house. The song goes on too long. "Colour of the Outside" has a beautiful intro. It drifts in from some chilled air that isn't quite cold or unpleasant. The chorus heavily reminds me of a Sonic Youth song that I can't remember the name of. It might be "What We Know" from The Eternal. That song has a lot more drive, something that I think is really missing from this album. Also, as you can see here, a lot of these tracks overall sound like later-era Sonic Youth, especially those by Lee Ranaldo. A noise plane lands, and then a jangle pop song begins, "Chicane, OH". This one has a nice dreamy sound, Strawberry Switchblade or The Cure on Wish. I really liked this one, though I didn't expect to. It was a break from the emotional overcast of the last few tracks. This song could be shorter. "I Stared At Moses and the Burning Bush" is alright; it just kind of goes. That is until the latter half and the end, which really make this song. I think this is my favorite from this album. I love the slide guitar on "The Science of Dichotomies", recalling The Dream Syndicate's "Too Little, Too Late". I also love the drums. This was a good song all around. "Glories" is an awesome song too. Some of it reminds me of "Gooseflesh" by Blød Maud, a Pittsburgh band that had described themselves as post-pop-punk, which makes sense for Casper Skulls as well. Anyway, all the instruments, lyrics and vocals on "Glories" are awesome, and there is a drive to this one that was missing earlier on. I also love the big noise guitar solo. "Faded Sound" ends the album with a vaguely Nocturnal Projections thing, a big epic like the beginning. I still have some of the same issues, but it works. Mercy Works is an interesting album. I was disappointed for the first half, not that it was necessarily bad. There are too many epics. By that, I mean that too many of the first songs have such huge sweeping emotions like the cloud on the cover of Neil Young's Prairie Wind. It's too much that there isn't room to breathe. Also, early on, I hear such a strong Sonic Youth and Pavement influence, the songs sounding way too similar to those bands' songs. Finally, a lot of these earlier songs are way too poppy and melodic with super clean production that I have previously described as jarring; it is somewhat unpleasant. That said, I did enjoy most of the last half and some of the first half. I like a lot of the lyrics and the guitar solos, when they do happen. I can't say I really love this album, and it also isn't bad. If only it was more like their live sound, this but just slightly less polish. I will give Mercy Works a Neutral. Too bad, but this is a band with a lot of promise. I will await their next release.